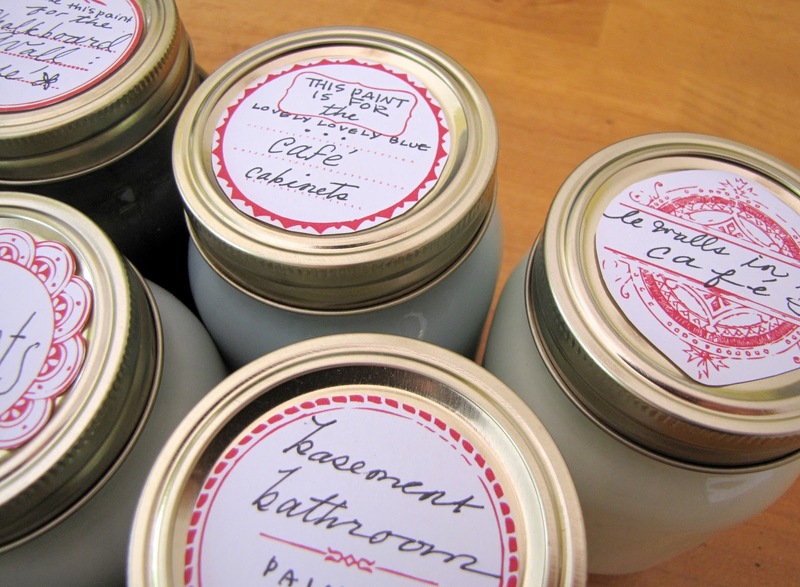 It just makes good sense to keep the leftover paint from a painting project. we have lost the can, entirely. Is it in the garage? Shed? The closet of the room in which the paint was used? my leftovers got out of hand. I went through every nook and cranny and piled up my paint stash. To save you time counting, there are 44 different containers here. Half of these colors I no longer even use! who buy our home next year, to simplify the stash. And lessen our woes when we need to touch up a spot here and there with fresh paint. 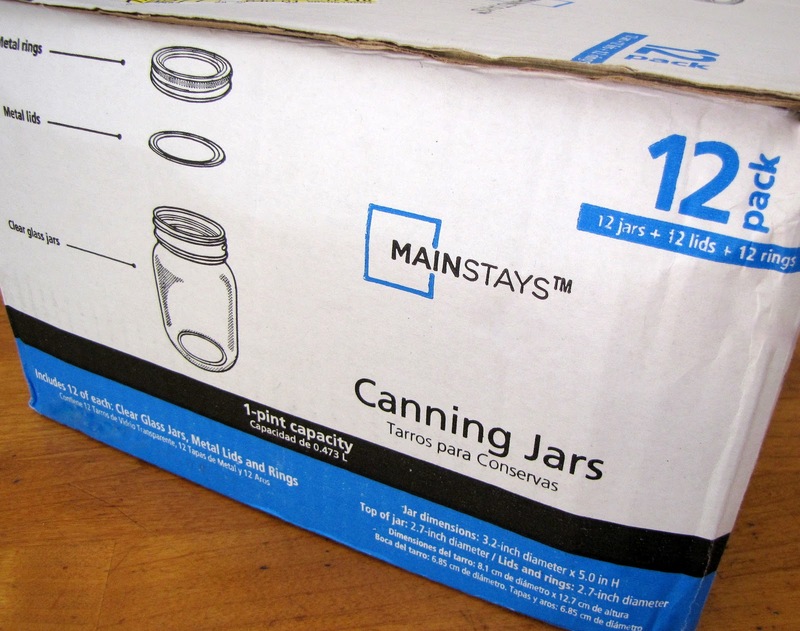 I bought this box of jars at Wal-Mart for $6.50. 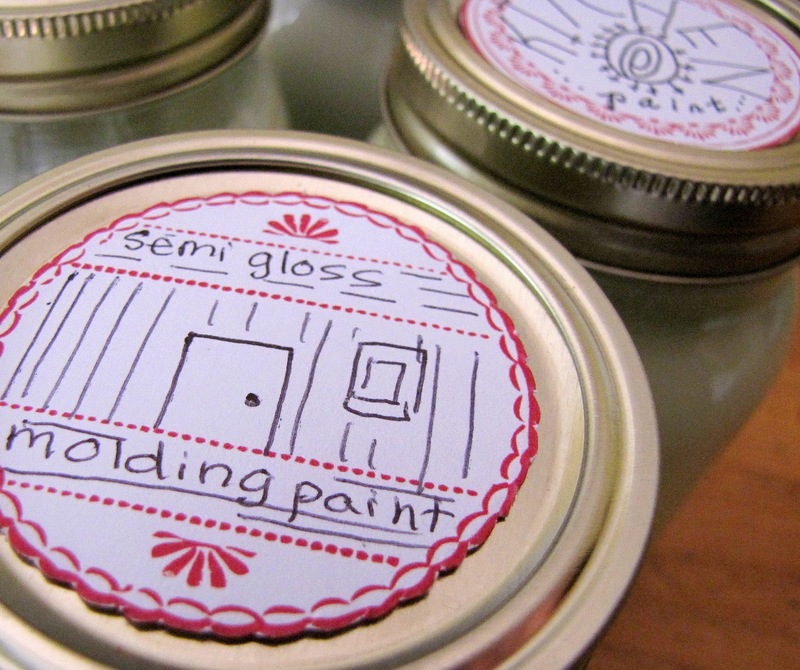 cut them out, used double-sided taped and attached them to the jar lids. 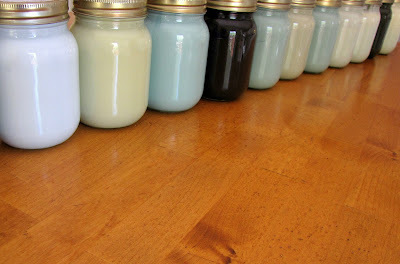 I simplified and only had 12 colors of paint left that needed jars. simplifying is first on my to do list. The front door color, HERE. Our office is nearly done. 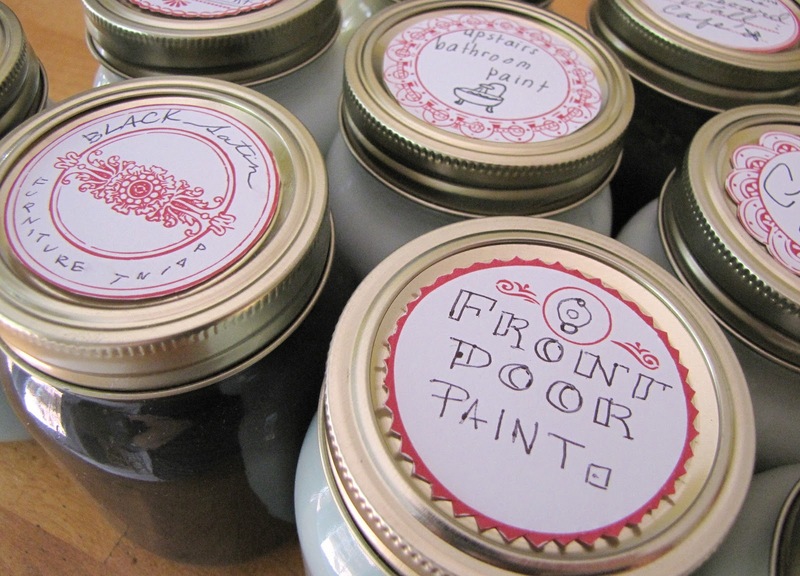 write those on these labels, too. 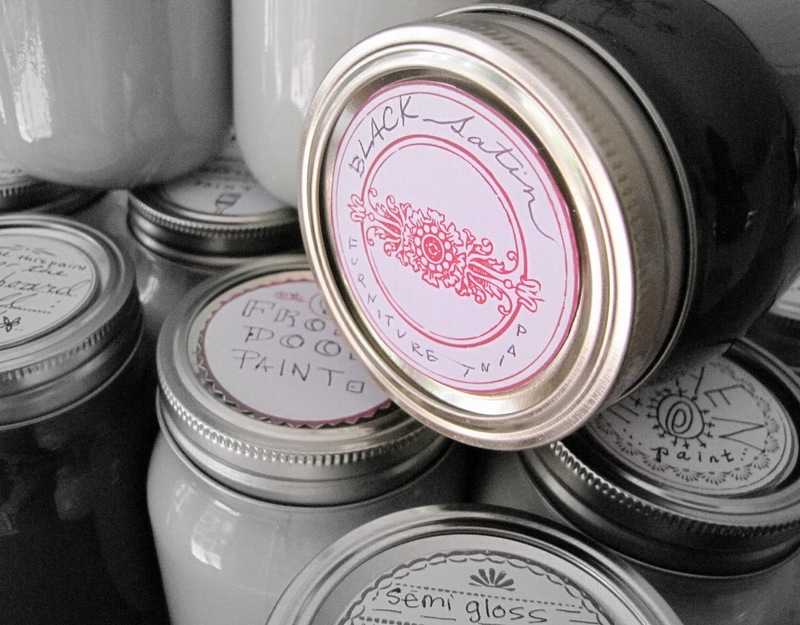 I know there will be more than only 12 jars of touch-up paint. For now, we only need these, which is nice & easy. since we can never reach what's in them? I decided many years ago that they are actually for storing our seldom used leftover paint. 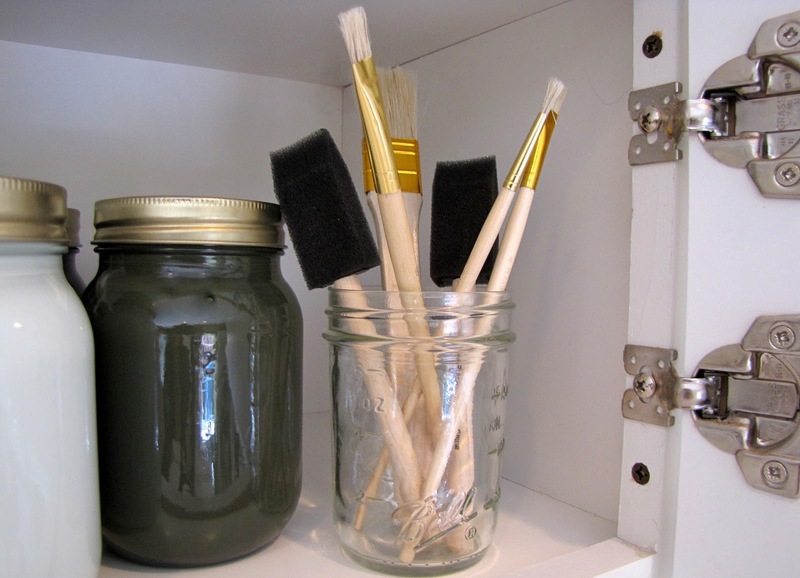 I've always stored my touch-up paint there. I don't store paint in the garage or a shed. and above the fridge in the cabinet is best for us. While at Wal-Mart, I also got an assortment of brushes. and especially ecstatic that this project is finally done! 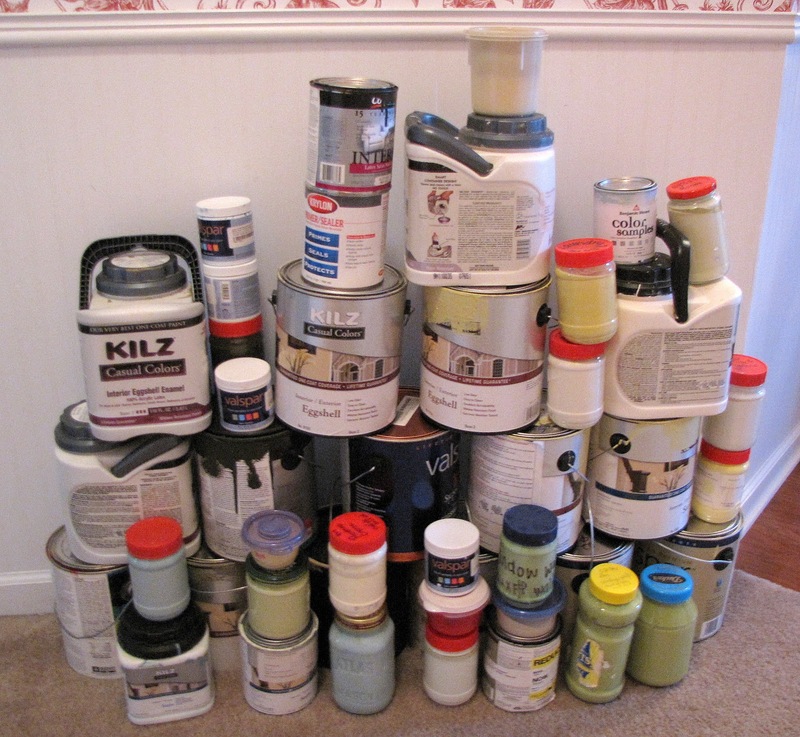 What's in your paint stash? Amazed me once again! You need to contact the Nate Berkus show and share some of your ideas with the world through television. Wow, Linda. Maybe I will!! What's in my paint stash? 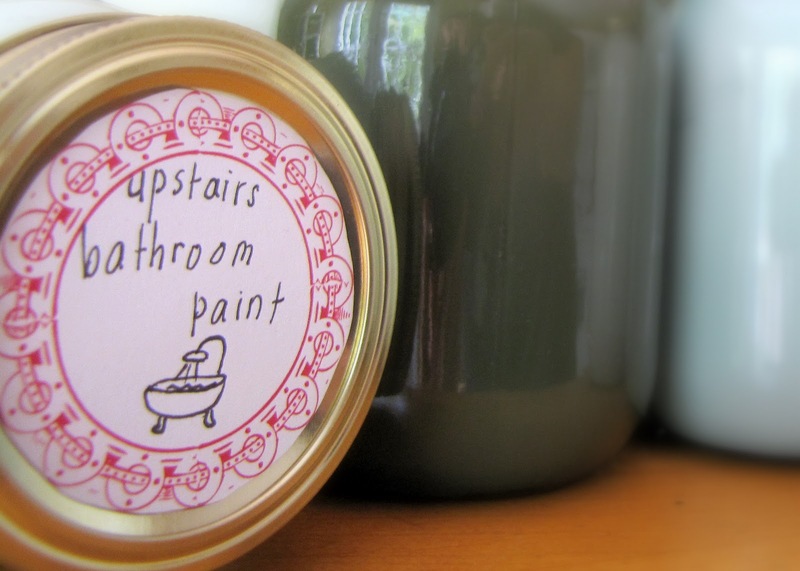 We just moved into this townhouse, which is not mine, but in our past nineteen homes past, I ALWAYS jarred the leftover paint. Every six months, I obeyed my calendar that said, "Touch up walls in ________." I sometimes used something as humble as a q-tip to accomplish touch-ups. Other times I used a mini-roller. Most often I used a sponge wand, like you showed. But these labels? How long do you think it took me to download those beauties? As fast as you can say "touch-up!" Thanks for sharing them. I did the same thing and a few of my friends followed suite...I think all of our hubbies were thrilled. 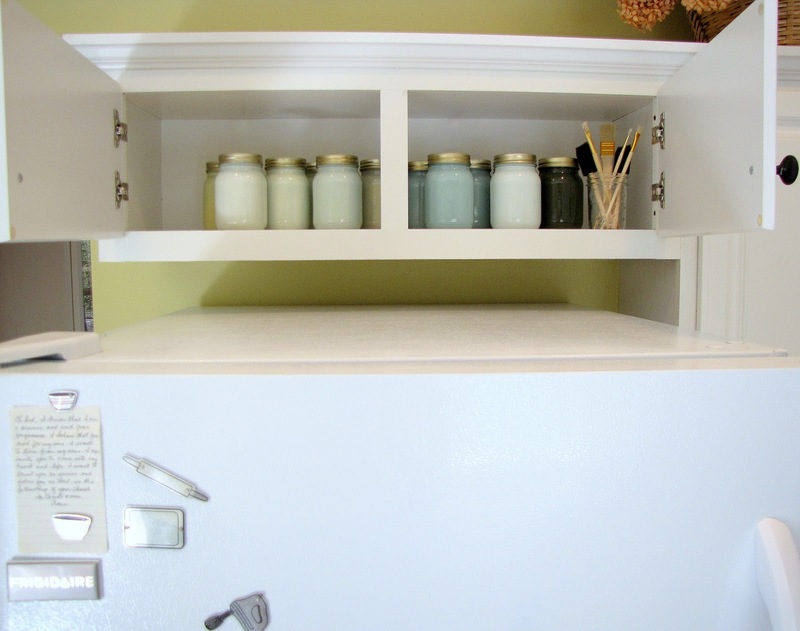 Great idea Leslie, and it looks so good, I love beautiful and practical organization!!! Love the over the fridge idea. 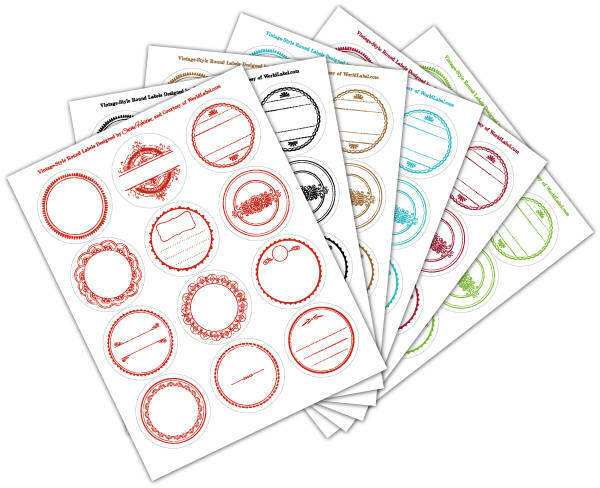 I recently did a blog post about filling up wasted space - lol! This would fit right in. What a great idea! I love that you can see the color of the paint and that it's all in one place. I might be copying your idea! What an ingenious idea. Love it! 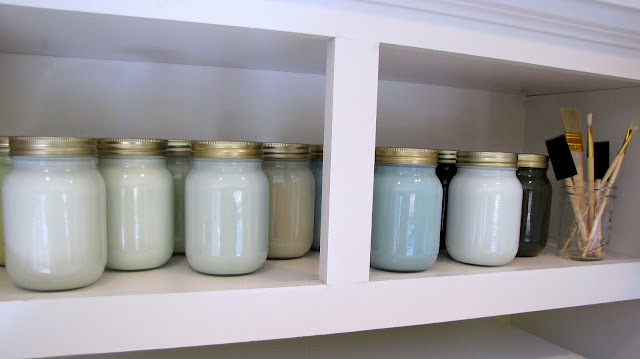 I love how the paints look in the jars. The labels are genius. And the cupboard above the fridge? Do you know I don't have a cupboard above my fridge? In 28 years of marriage I've only had a cupboard there in 2 houses that I can recall...and we've lived in lots of houses! C'est magnifique! Brilliant and such a great use of storage space too. OK girl, that is awesome, and looks pretty too. Great idea! I have a paint stash at least that big, and the chore has been on my TO DO list forever. I just want to be able to touch-up the spots here and there in each room but am intimidated by the organizing. I like your idea because you end up with something pretty. Very motivating! 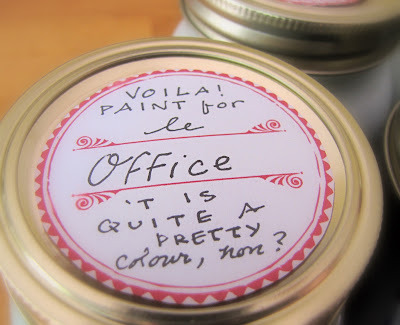 I did the same thing with my leftover paint a few years ago. I have NEVER regretted it. 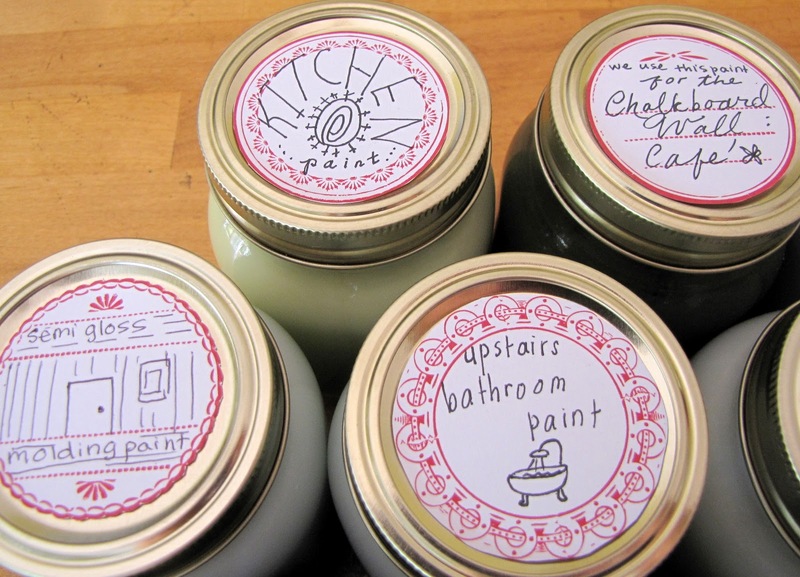 Since we've been renting for the past many years, we don't have a leftover paint stash. But I love your clever idea. 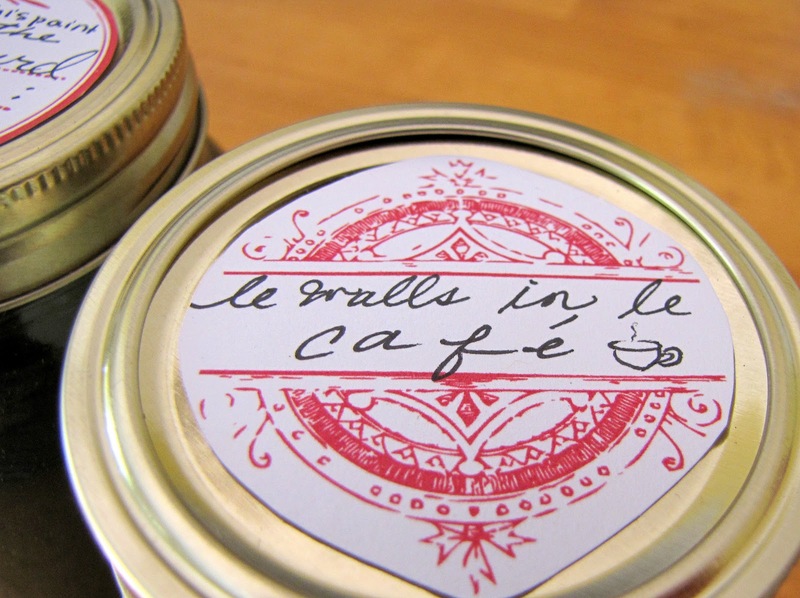 Great idea and the results are so charming. Doesn't that kind of project makes you appreciate the thrill of organizing? Wow, you want to come organize my stash, too? Good idea and thanks for sharing at Wow. Fantastic idea! We are getting ready to clean out our garage so this will be the perfect time to try this! Oh this looks so nice! I really need to do something like this with my paints. It's getting to be a little out of hand!! I've been meaning to read this for days. This is awesome! I had mentioned it to G. earlier this week and he thought the idea was great. Love the matching jars and the over-the-fridge extras too. YOU KNOW I'm doing this. Thank you for sharing, P.
That is a great use for the above-the-fridge cabinet. I use the plastic nut containers from cosco. Love your blues. I am glad this project is over---you try it, too! I have created a paint corner in our basement storage area but this will really help to tidy it up more! Thanks so much for sharing this great tip. I even like how much prettier the jars are than the bulky cans. 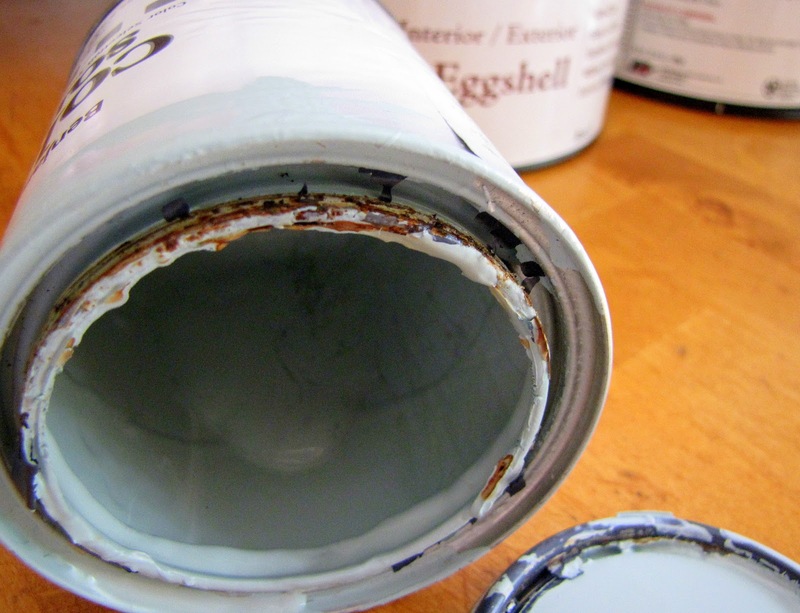 It’s always better to err on the side of caution when buying paint. The last thing you want is to run out of your perfect colour with one wall left to tackle. plastic jars are better...they are not that fragile, they dont break when hit. i already made this mistake putting paint in glass containers, i ended up whit nothing and cleaning. 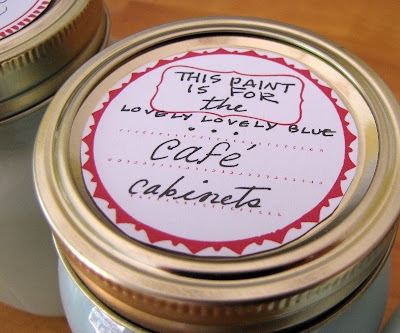 I love this -- your tips are great because it preserves the paint, saves spaces and is a way to get rid of all those awful paint cans! 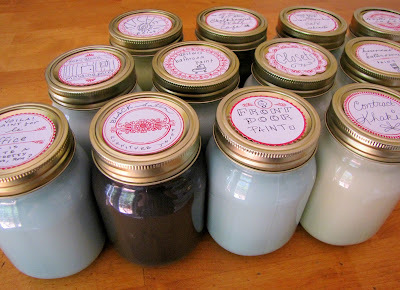 I like that you used inexpensive jars from Walmart, too. Yeah but also you should put on the label what paint it was (product, sheen, color name or number) because you will need to know that if need more..
Do you remember what color paint is in your master bathroom? I love it. I actually am working on a doll house and have done the same thing for it, except I put them in baby food bottles...and ah...I can't really put them in the cabinets above the refrigerator in the dollhouse, but I can them in my house. Thanks for a great idea! To prevent hard to open paint jars, cut out trash bag squares to put on the top of the jar before screwing on the lid. 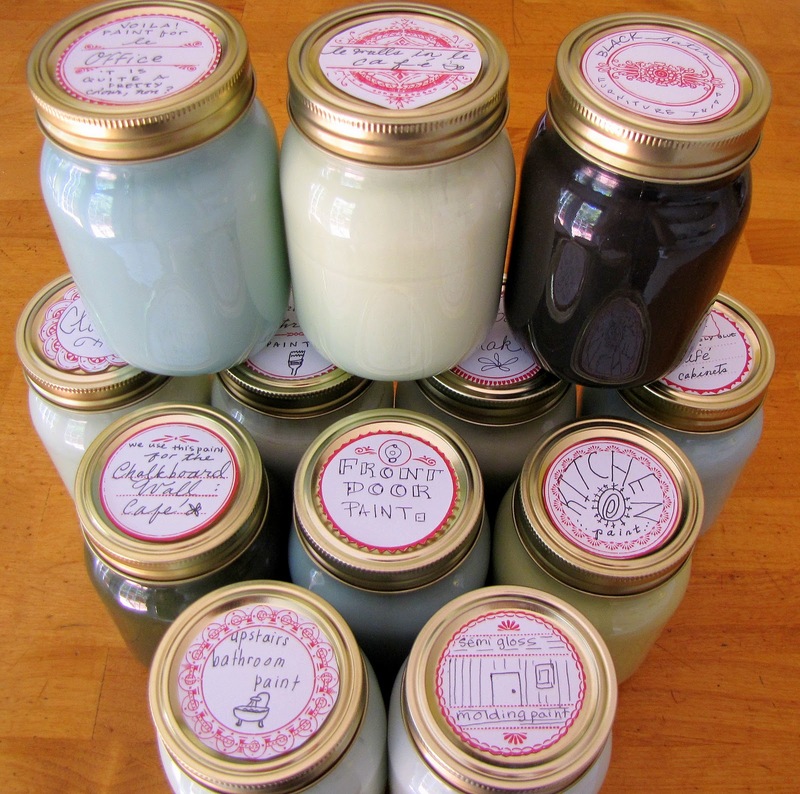 For impossible to open jars, place upside down in boiling water for a few seconds. Lids screw right off. I have tiny worthless cabinets above sink and kitchen windows, perfect! I just finished painting kitchen, entry and dining room and poured up left over paints into cottage cheese containers. Hubby said, that's not very safe. Plus I have to climb up into his boat to get to the shelf I have them on. So I'm putting this on my project list! I will use plastic jars tho, I have problems with my hands and I drop a lot! Love this idea. Will be dong this very soon. You might want to add a layer or two of waxed paper over the paint and under the lid. This will help to keep the paint from sealing the lid on the jar. 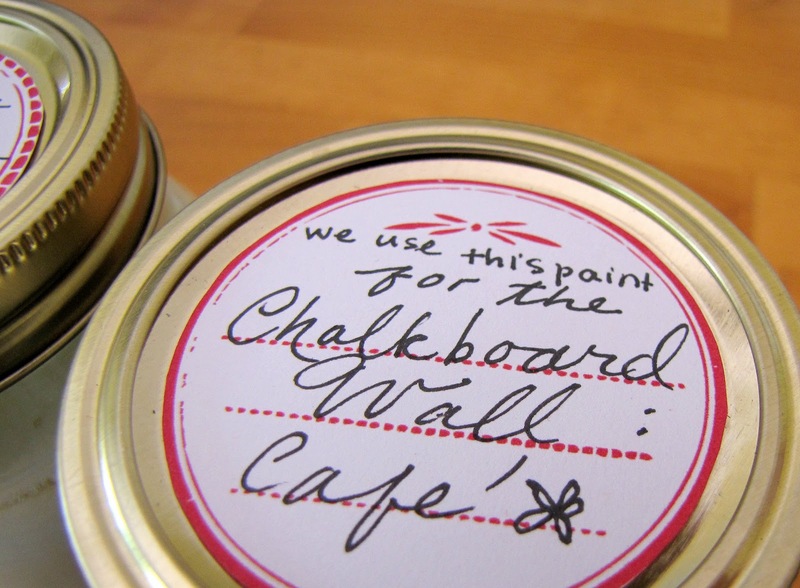 I use this when I only have less than a can of paint left. For 6 years I have been putting my left over paint in used pasta sauce jars.